: Guard dog, watch dog and livestock guarding dog. : Portuguese Kennel Club. Revised by Jennifer Mulholland and Renée Sporre-Willes. : One of the most ancient breeds in the Iberian Peninsula, it owes its name to the village of Castro Laboreiro, located in the Melgaço municipality in the extreme north of Portugal, where it comes from. It is a rustic mountainous area, ranging from the Minho River to the Peneda and Soajo Mountains with altitudes of up to 1400 m. It is delimited by the Minho, Trancoso, Laboreiro and Mouro rivers. : The breed has a slight mastiff type. A vigorous animal, of attractive morphology and often of striking coat. It has a severe an serious expression and the rusticity of a mountaineer. : Moderately long (Sub-longilinear), with length of body to height at withers relation of 76; the depth of the chest is slightly less than half of the height at withers. The superior cranium-facial axes are slightly divergent. The muzzle is slightly shorter than the skull, i.e. skull to muzzle relation is 65.
: A loyal and docile companion to its family, it is essential in flock protection against wolf attacks which, in the breed’s area of origin, are still very frequent. Due to its constant vigilance, it is an ideal sentinel of property entrusted to it, patrolling it frequently. Of noble nature. Very agile and active, it can show some hostility, without being quarrelsome. It has a characteristic alarm bark, starting with a deep sound, rising to low-pitched and ending in prolonged high-pitched sounds. : Of medium size, showing lightness rather than coarseness; smooth without being lean; skin well developed but without wrinkles; long and tending to rectilinear. : Moderately developed, slightly prominent and moderately broad. The superior cranium-facial axes are slightly divergent with a profile tending to rectilinear. ; The superciliary arches are slightly developed with a hardly noticeable frontal furrow; the occipital protuberance is not pronounced. : Not pronounced, placed at greater distance from the occipital protuberance than from the tip of the nose. : Well developed, in line with nosebridge and large. Nostrils wide open. Always black. : Long, straight; strong; tapering gradually towards the tip, without being narrow or pointed. : Well cut, with medium and inconspicuous commissures; neither fleshy nor pendulous; the mucous membranes of palate and edges of lips are strongly pigmented in black. : Powerful, well muscled and close fitting jaws. Full dentition, strong, white teeth, well adjusted and well set into the jaw; scissors bite, a pincer bite may be accepted. : Flat, converging moderately to the tip of the muzzle without tapering. : Of medium size, almond shaped, slanting, set level, neither prominent nor sunken. Brown in colour, ranging from light brown in paler coats to dark brown, almost black, in the darker coats. The expression is somewhat severe. Black eyelids. : Fairly high set, falling naturally parallel to both sides of the head; hanging. Thin and almost triangular, rounded at the tip; of medium size (length equal to width). When attentive the ears turn forward. : Well set into the body and head, conferring to the head a proud carriage; short; straight; well developed and of proportional thickness; without dewlap. : Level or slightly sloping. : Well set into the neck and body. : Medium length; strong; longer than the loin. : Short; broad; well muscled; in harmonious connection to the croup. : Short, broad, well muscled, with a smooth inclination. May be slightly higher than the withers. : Oval shaped medium width and depth. : Considerable rise from sternum to groin; the belly is not voluminous and shows a distinct difference in line between the sternum and the belly area. : Natural, of higher than average set, thick at the base; at rest, it falls down to the hock, hanging not too close between the fringed buttocks; tail with thick and long hair, especially on the underside, giving it a thicker look in the middle, with a very hairy underside on the third part of the tail. It has a graceful scimitar shape and is usually carried low; if the animal is excited, the tail rises over the top line, tilting up, forward and slightly sideways, but never down to touch the back. : Strong and well muscled. Very straight, when seen from the front and sides; well developed bones. : Well developed joints. Medium angle between scapula-humerus. : Well developed with powerful muscles. : Straight and gradually tapering from top to the pastern; well developed bones, somewhat cylindrical in shape. : Neither too long nor too inclined. : Proportioned to the size and more round than long, tending to cat feet; with thick, tight-fitting toes, naturally arched, neither turning outwards nor inwards; well developed nails, black or dark grey, smooth, hard, moderately worn. Thick and hard pads. : Identical to the forefeet. : Strong and well muscled. Very upright, when seen from the back; well developed bones. : Well developed with powerful muscles, easily seen from behind. : Moderately open femur-tibial angle. : Well developed bones, well muscled. : High; the hock line slopes slightly forward; well developed joints and moderately open tibia-tarsus angle. : Well developed bones, somewhat cylindrical in shape. May have single or double dewclaws. : The gait is rhythmical and easy, with the legs moving parallel to the middle body line. The most common gaits are a natural walk and sometimes an easy amble trot; it will only move faster (trot or gallop) when a strong reason urges it to do so. : Short hair on body (approximately 5 cm); without undercoat. Slightly dull, smooth, flat on most of the body and very thick; in general it is shorter and denser on the head and ears, where it is thin and soft, and on the limbs below the elbow and hock. The hair is thick and long on the buttocks, which are very hairy; thick, resistant and somewhat harsh to touch. : The most common is the wolf colour and the most preferred colour is the “mountain colour”, so called by the locals and considered as an ethnic trait by the breeders in Castro Laboreiro. 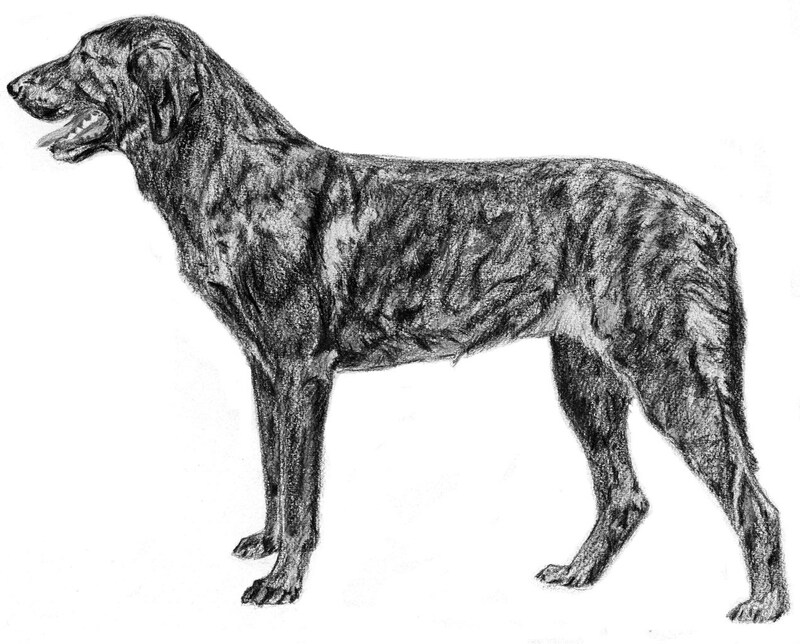 It is a brindle coat with a base colour of different shades of grey overlaid with lighter and darker shades of black brindling. It is typical with hair of three different colours; ranging from pine-nut to reddish and mahogany. The brindling can be of lighter and darker shades on different parts of the body; darker on head, back and shoulders; medium dark on body, croup and thighs and lighter on belly and lower parts of the limbs. A small white spot is permitted 0n the chest. Males 58 - 64 cm (with a tolerance of + 2 cm). Females 55 - 61 cm (with a tolerance of + 2 cm). Males 30 - 40 Kg. Females 25 - 35 Kg. Behaviour Animals showing signs of shyness or distrustfulness. Head Too voluminous, bony or fleshy, too narrow, long or pointed. Ears Atypical set-on, too big, fleshy and round. Colour Small white spot outside the limits set by the standard. Tail Hunting-horn shape, curled or with hook at the tip. Behaviour Aggressive or overly shy. Skull/Muzzle Convergent longitudinal superior cranium-facial axes. Nose Any colour other than black. Eyes Wall eye or difference in sizes. Tail Docked or rudimentary. Anurous. Colour Albinism. Pied or very different from breed type.